Hey, remember me? Cause I sure remember you!! Sure, you’ve tried to hide the time(s) that you passed out on your friend’s couch and woke up naked, with no eyebrows, with writing all over your face and wondering how marshmallows got into certain places. But somewhere out there are the photos your “friends” took and you know it’s only a matter of time before they appear. Those photos represent the bones of your closet skeleton. I’ve got so many bones in my closet that I could create my own little Skeleton Army, but it was what was OUTSIDE of my closet last night that got my attention. Earlier in the day I noticed Savannah trying to dig through her crate of toys and struggling to get to the bottom. 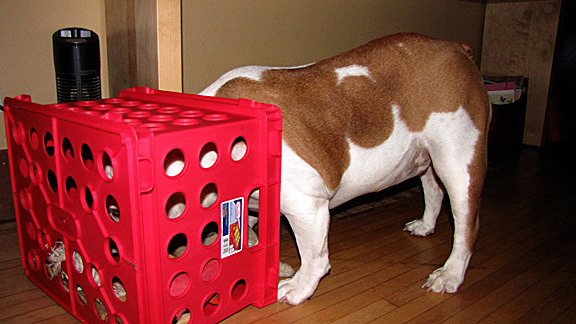 So being the good Dad that I am, I turned the crate on its side so she could get to everything. Ohhh... I forgot I had these!! Savannah thoroughly enjoyed going through the crate. During the day I saw her going from the crate to our bedroom several times but didn’t think much about it, until I went into the bedroom. My first thought was I need to get a bigger closet because this one obviously isn’t big enough anymore. Then I realized those weren’t MY bones. What’s in your closet? 15 bones and a baby. 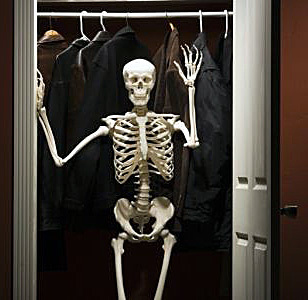 Turns out she wants to add, or maybe hide, her bones to my closet. 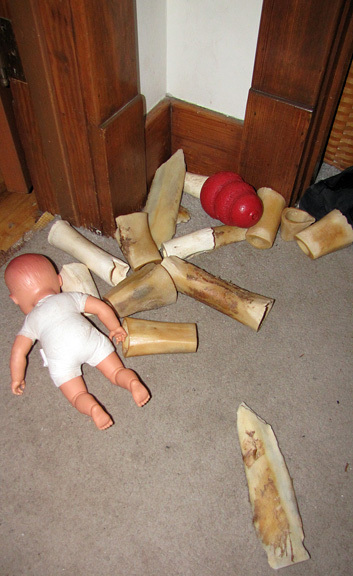 Our bedroom is the only room that still has carpet, besides the basement, so Savannah likes to go in there with her toys (bones, Kong’s with peanut butter, Dr. Pecker bottles (click to see pic), etc.) because she can get better “traction” than on the hardwood floor. I guess Savannah couldn’t remember which bone was her favorite and decided to have a little taste test. I think she included the baby as an impartial judge to make sure she sampled everything. I don’t know which one was her favorite but I have to tell her there isn’t any room for more bones in my closet. 4 Responses to What’s In Your Closet? Why is it that the baby scares me more than the bones? 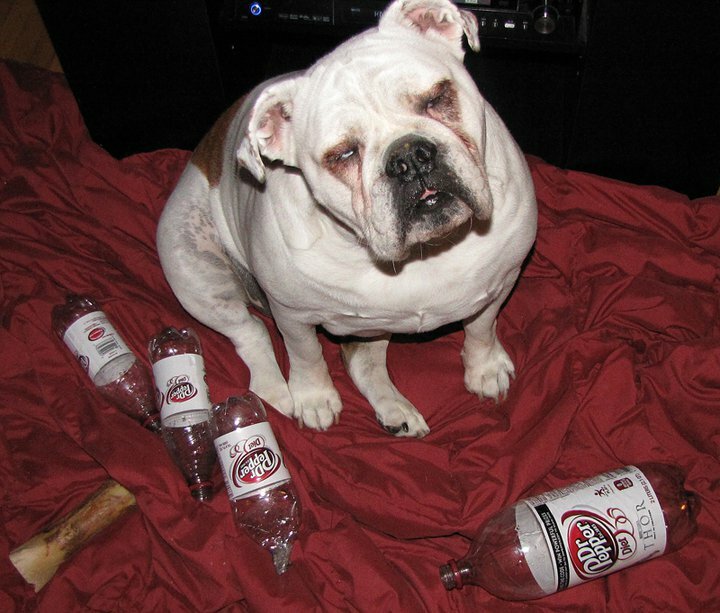 I just love dogs! I love that Savannah included the doll. She’s obviously a nurturer. Our dog Gizmo (may she rest in peace) used to bury all of her milk bones around the yard, for “later”. One day we got a good rain and dozens of milk bones started floating to the surface. You should have seen her running around the yard in panic, trying to retrieve all of her buried treasure. She was a jewel of a dog. Human in a former life, I swear. We had her for 13 years. She passed away about 5 years ago. I still miss her. I’m a little disturbed by the marshmallow incident. That’s hysterical…but the baby doll is freaking me out!